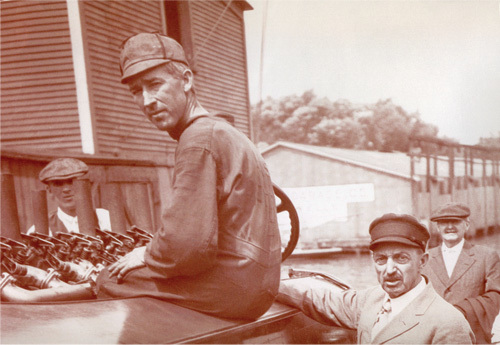 Chris Smith son of a black-smith & Gar Wood son of a ferry-boat operator came together to make the village of Algonac the center of motor-boating and racing, Chris by being the first man to install a motor in a boat, Gar by reigning supreme in making boats go faster.. They created an industry employing thousands, and leisure activities enjoyed by millions. One, taciturn with a wry sense of humor; the other a challenging sense of derring-do. Chris sired a large family, all of whom made major contributions to the company. Gar had just one son, Gar Jr. a champion boat racer in his own right. The fleet of record setting Miss Detroit, and Miss America race-boats often had Wood/Smith teams in the cockpit racing in America and overseas, ultimately capturing all the major trophies.